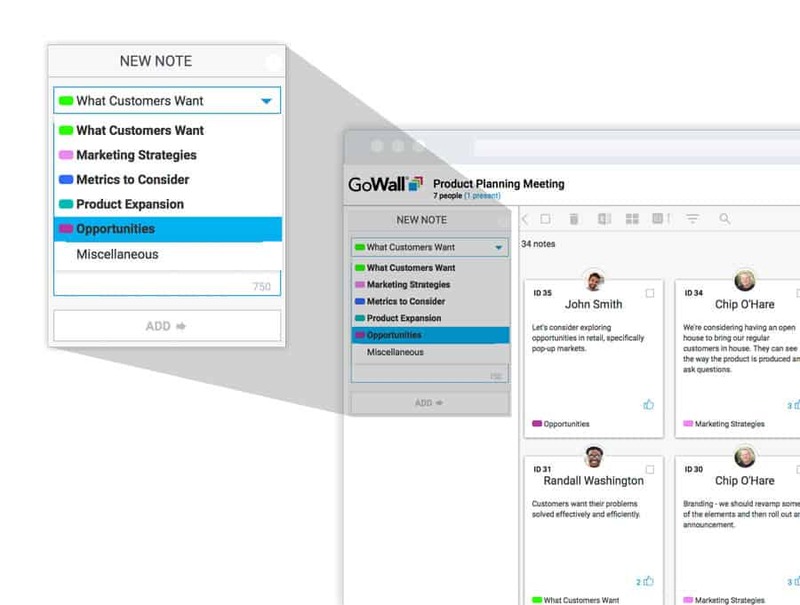 Features | GoWall — Better Meetings. Guaranteed. 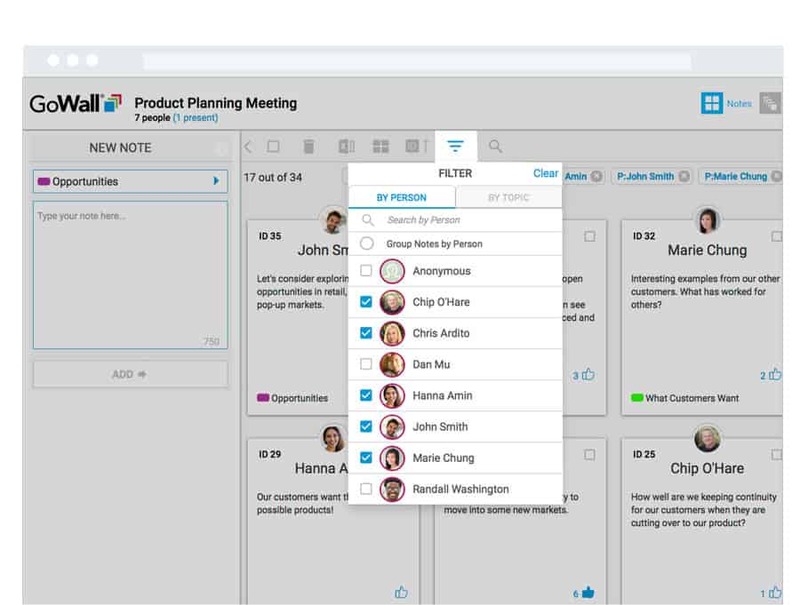 Improve the way you run meetings and collaborate with your team. Our customers use GoWall in every type of meeting, including in-room, virtual and hybrid sessions that mix in-room and virtual participants. 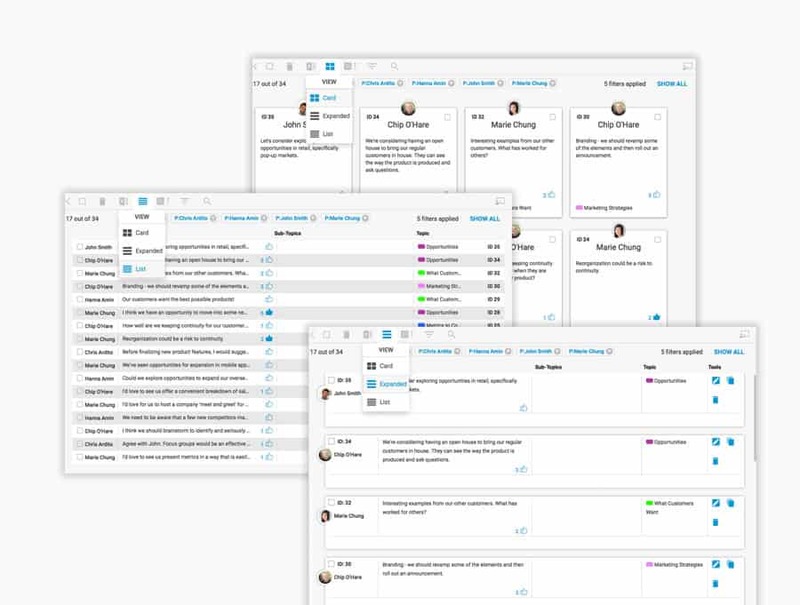 GoWall is also uniquely effective for synchronous meetings where everyone contributes at the same time, and asynchronous meetings where participants log into GoWall on their own time. GoWall works on desktops, laptops, and tablets. 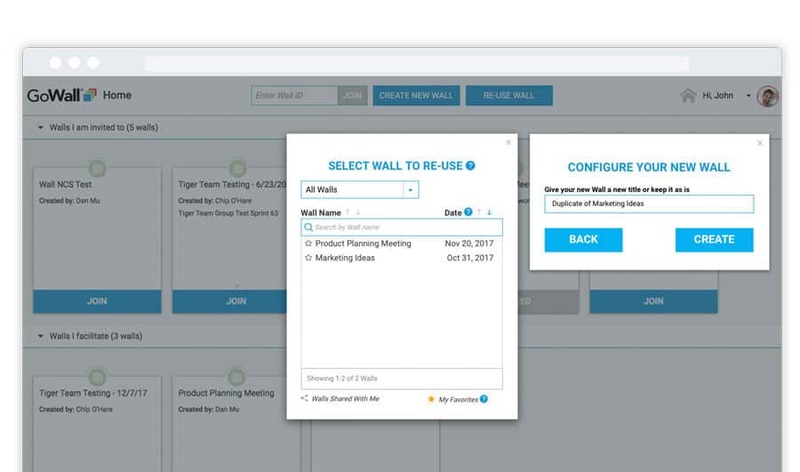 Cloud-based and browser accessible, GoWall can be used with other collaboration tools like WebEx®, GoToMeeting® and Skype™. User-friendly Note Walls create participant neutrality and encourage 100% engagement. Type your note and click “Add.” Individual notes are added to the wall. Crowdsourcing and “Liking” adds transparency, encouraging participants to build on each other’s ideas and vote on topics. Participants can “Like” each other’s notes and sort based on most or least “Likes”. Optional anonymous feature gets people talking about potentially sensitive issues. You can poll everyone on the call on a particular topic. Participants can post their notes to the wall with their privacy intact, ensuring honest feedback. Topics provide structure while encouraging focused participation. Topics are powerful tools that help you eliminate ad hoc conversations that can derail a meeting. Creating focused topics gives you an outline for the meeting you are about to lead. Fields within topics let everyone get very specific. Three types of lists – text, numeric, and multiple choice – help you target your questions and are easily accessed by participants. 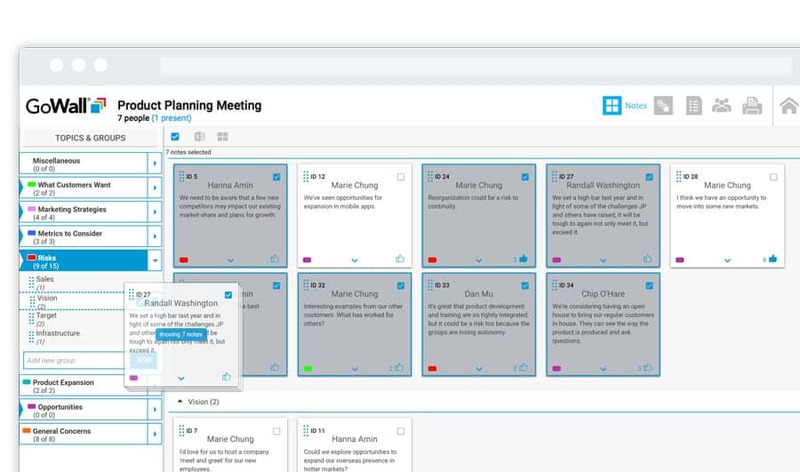 You can sort by field during the meeting and after the meeting when exporting the notes. Themes begin to emerge and guide the conversation. Search and filter functionality gives you and your participants a quick view of people and ideas. 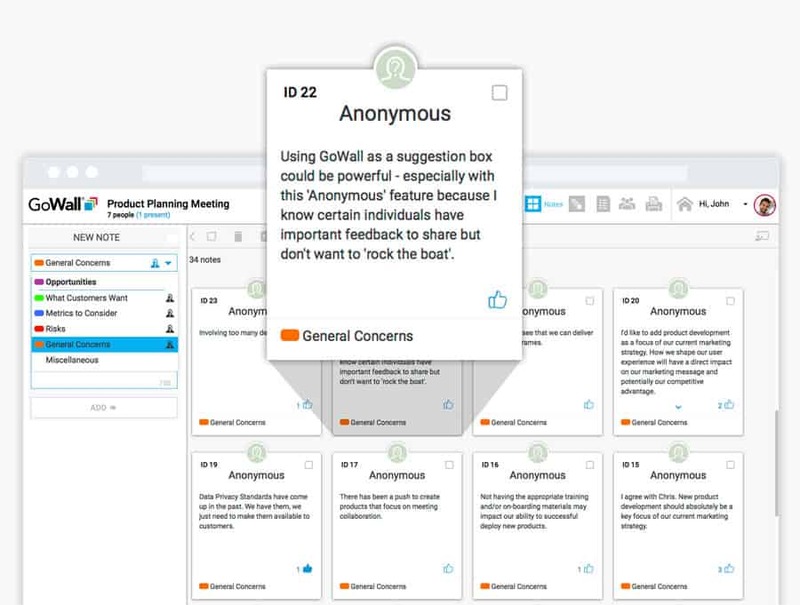 You and your participants can customize the way notes are viewed. GoWall offers three different note views. The card view is a perfect place to start. Expanded view is helpful for seeing dropdown field responses at a glance. List view is great for scrolling through “Likes”. Once key themes are identified, you can move notes into categories, just like sticky notes on a whiteboard, only readable! 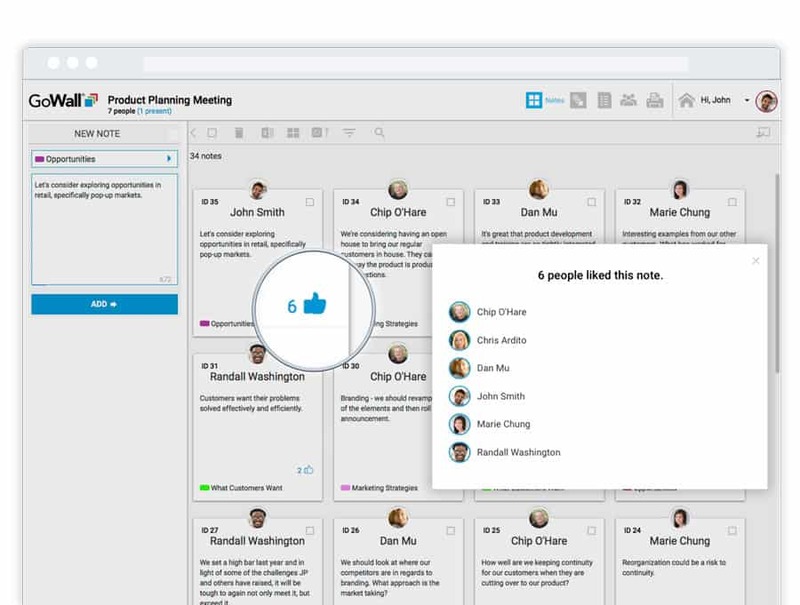 If you love sticky notes, but your participants are remote, you will love the simplicity of our drag ‘n drop Grouping Wall. 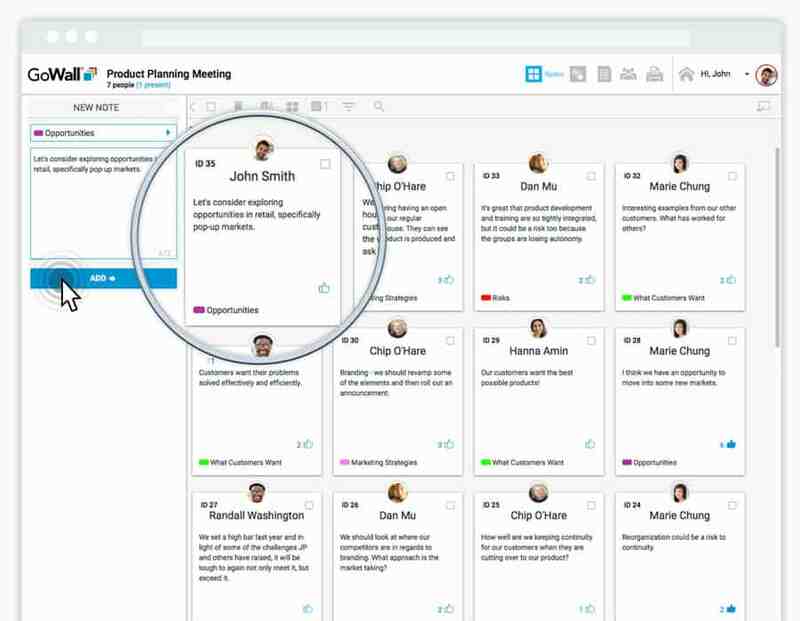 Wall templates can be re-used and shared, saving you valuable time especially when planning meetings on the fly. You can easily build a new wall using the topics, lists and components from a previous wall. 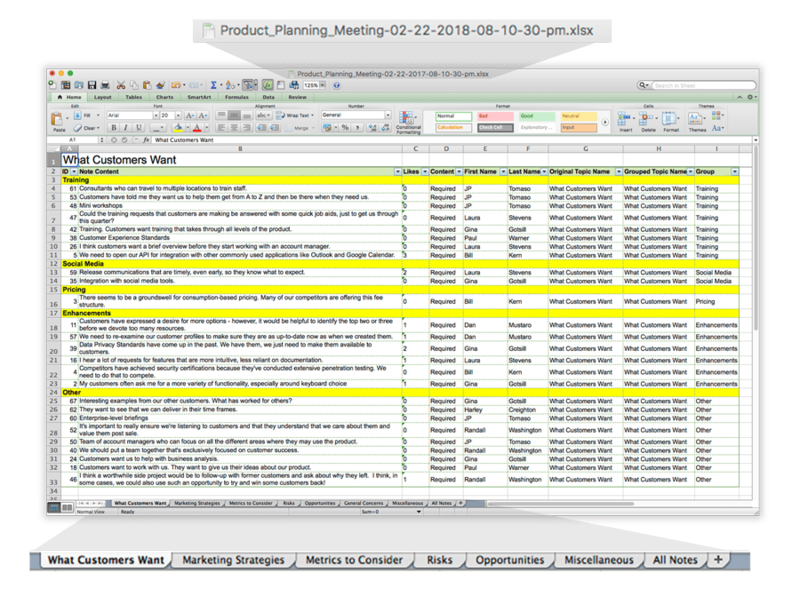 One-click export from the Note Wall or Grouping Screen to Microsoft Excel® and meeting notes are ready to distribute, no transcription required. Export is automatically named and dated as well as categorized. No more transcribing the whiteboard or flip chart. 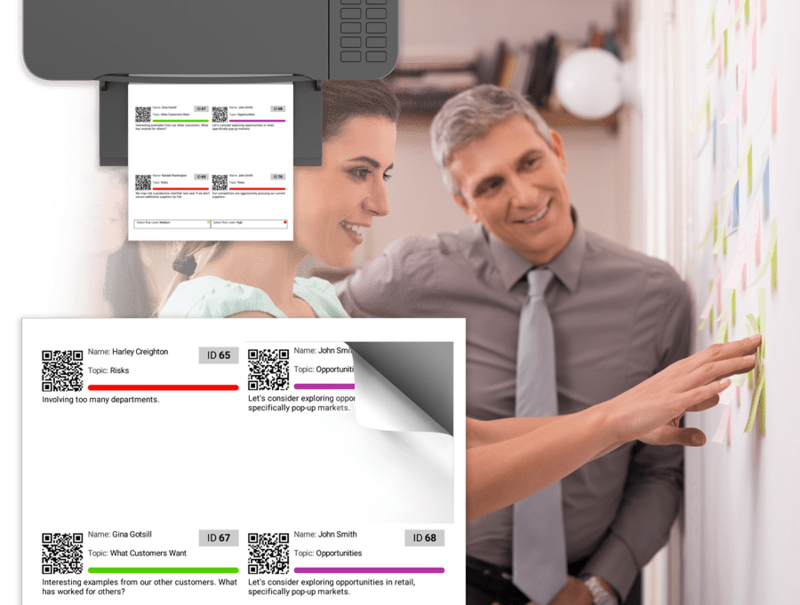 Notes can be printed on demand and grouped by category on a physical wall. Grouped notes can be scanned back into GoWall using any iOS device and exported to Excel®. 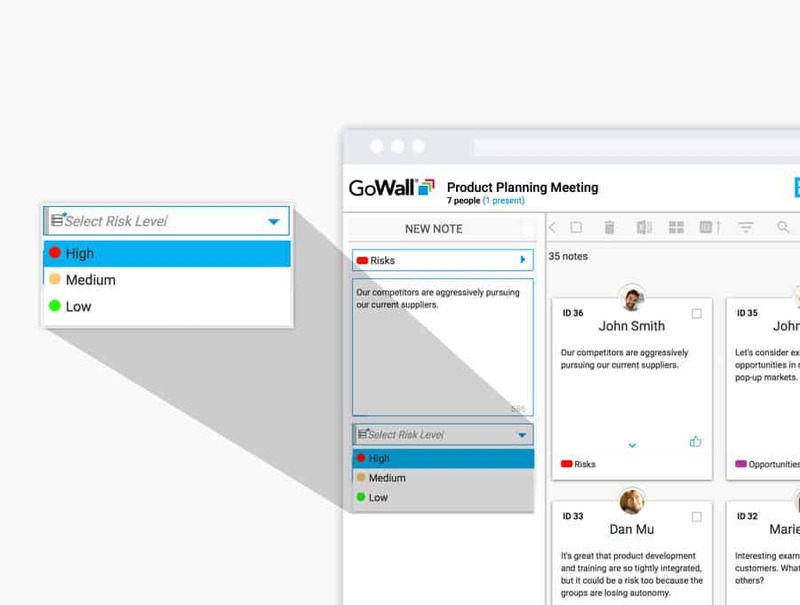 GoWall is the only collaboration app that completely supports in-room and virtual meetings.